The Great Gatsby is the retrospective story of one summer on Long Island told from the perspective of Nick Carraway (Toby Maguire), a failed writer turned bondsman during the roaring 1920s. Nick has just moved to West Egg, the wannabe ritzy side of Long Island. He lives in a small grounds keeper's cottage next door to the illustrious house of the infamous Jay Gatsby (Leonardo DiCaprio). Across the bay from Gatsby's house lives Daisy Buchanan (Carey Mulligan), Nick's cousin, and her husband Tom (Joel Edgerton), a friend of Nick's from university. They live in East Egg, the high society, "old money" side of Long Island. You can't ignore a lady in red. Nick ends up traveling with Tom to the city of Manhattan and on the way the train breaks down in "The Valley of Ashes," a small area of land in between Manhattan and the rest of the world that is made up of factories, pollution, and beaten down people. This place is watched over by the bespectacled eyes of Dr. T.J. Eckleburg, a billboard that is slowly falling to pieces. Tom takes Nick to a small grubby little car mechanic's shop owned by George Wilson. Wilson's wife, Myrtle, also happens to be Tom Buchanan's mistress. Tom tells Myrtle to meet him in the city and the three of them hold a party in the small apartment Tom and Myrtle use as their love nest. Tom asks Nick to keep his secret about Myrtle from Daisy. Every weekend there is a huge party next door at Mr. Gatsby's residence, but no one has ever met the illusive Gatsby. Rumors fly around about who Jay Gatsby really is. Eventually Nick is invited to the party (apparently he's the only one who ever gets an invitation) and gets to meet the mysterious Mr. Gatsby. hopefully attract Daisy to one. As Nick and Jay begin to become friends Gatsby opens up to Nick about how he is in love with Daisy and that five long years ago they were going to get married. Unfortunately Gatsby had been called off to war and when he had been released he was penniless. There was no way he could ask Daisy to marry him so he wrote to her and told her he would come back for her when he had money. He asks Nick to set up a tea date with Daisy so that Gatsby could reveal that he had returned and still loved Daisy with every fiber of his being. Now Nick is holding two very heavy secrets and they both have to do with the lives of the people he loves most. Nick agrees to arrange the tea and Gatsby and Daisy meet again for the first time since Gatsby left for war. They begin a whirlwind romance behind Tom's back and Gatsby tries to convince Daisy to leave Tom and come and live with him in his huge house across the bay. As the climax of the film begins, Nick, Daisy, Gatsby, Tom, and Daisy's good friend Jordan Baker all head into the city for a distraction. 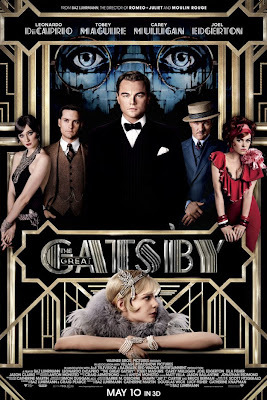 Lies begin to unravel and truths come out about who loves whom and Gatsby and Daisy leave the hotel room and drive back to the Buchanan's house but along the way something horrible happens in The Valley of Ashes which will set into motion the destruction of Nick's closest friend, Gatsby. This movie was thoroughly enjoyable to watch. 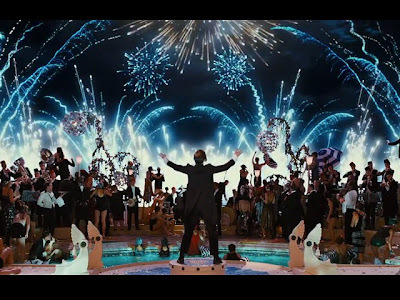 Everything about this movie was grandiose, from the costuming to Gatsby's elaborate party scenes to the underground bootleging pubs, even the dirtiness of The Valley of Ashes was over done. 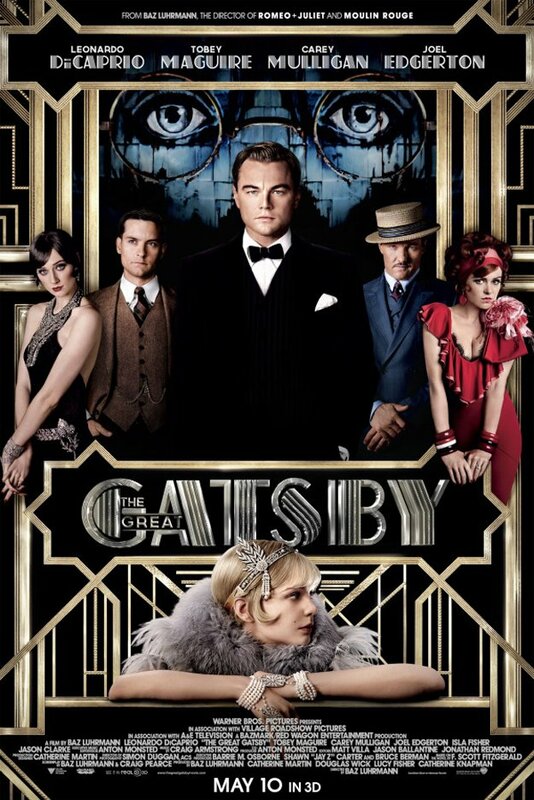 The Great Gatsby was a visually stunning reflection of the time period Fitzgerald wrote about. The party scenes at Gatsby's house were some of the busiest scenes in the whole film. Everywhere the camera panned there were dancing girls in skimpy costumes, booze flowing from elaborate fountains, confetti being shot out of giant replicas of champaign bottles, and a fireworks show that would put any 4th of July to shame. The colors were vibrant and deep and the sets were lush and breath taking. The costumers did a fabulous job of capturing the decadence of the 1920s in the elaborate dresses and 1920s Art Deco inspired jewelry. Visually, there was nothing boring about this movie. In fact it was very reminiscent of Baz Luhrmann's earlier films Moulin Rouge and Romeo + Juliet. is one of my favorite scenes in the whole film! The acting in this film was spot on. 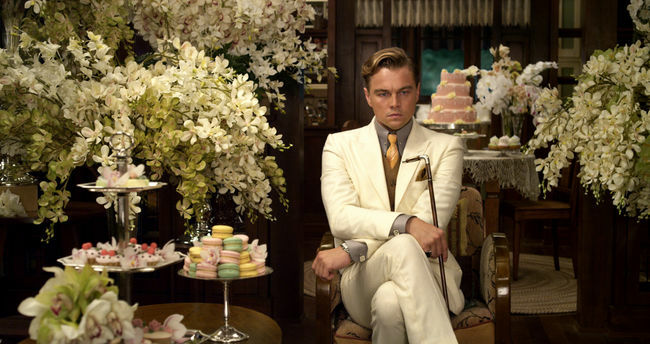 As DiCaprio has aged I have become a great fan of his films: Catch Me If You Can, Inception, and now The Great Gatsby. I feel like DiCaprio has truly blossomed into a great actor and his portrayal of Gatsby is impeccable. All at once he is showy, mysterious, and over done as well as boyish, vulnerable, and endearing. The only problem I had with his character was the way he said "old sport." I just thought it sounded funny and was annoying, but maybe that was what the director was going for. Toby did a wonderful job playing the "normal" guy of Nick. He was average and kinda plain when compared to Gatsby and Daisy, but we as the audience identified with him well. Carey did a great job with Daisy, who can be a very complicated character to play. On the outside Daisy is a silly little fool (which she says is the best thing a girl can be) but on the inside the audience knows she is hurting from the betrayal of Tom and torn between the man she has been married to and the man she has always loved. Love that head piece, girl! Is that from Tiffany's? The only thing in this movie that I absolutely disliked was the anachronistic music by Jay-Z. First off I'm never easily sold on music that is not from the time period the story is in because I am a music person. Every period has wonderful music. Why do we have the audacity to say that our period music is what should be used to set the mood of this story. The Great Gatsby in set in the 1920's during the historic rise of Jazz in New York City. The only scene that has a nod to the Jazz movement that was happening is when Nick is at the party at Tom and Myrtle's love nest and across the street an African American man is out on a fire escape playing jazz on a trumpet. So my question is, why was there so much rap and hip hop in this movie when those styles of music didn't even exist yet? I understand the director was trying to do "something" by choosing that music and there were lots of reviews that said they liked it, but to me it was a slap in the face to the great music of that time and a cheap knock off. Music is what helps move the emotional story and every time a hip hop or rap song began it jarred me from what I was feeling and interrupted the story. Anachronistic music can be done well, like in A Knight's Tale, but I think Luhrmann and Jay-Z just completely missed the mark on this one. Over all I thought this movie was well done and a good adaptation of the Fitzgerald novel. With colorful characters and vibrant scenes the viewer will walk away dazzled as well as contemplating the truths of the human condition. Luhrmann endears us to Fitzgerald's characters and their lives and he helps us understand the decadence of the time period. I would recommend this movie to someone who loves the story of The Great Gatsby, loves Luhrmann's work, is a DiCaprio fan, or just plain loves period pieces. I hope you enjoy this film as much as I did!